A new set of 18 microsatellite loci was developed for the threatened Australian freshwater fish southern purple-spotted gudgeon Mogurnda adspersa (Eleotridae) using a next generation sequencing approach. 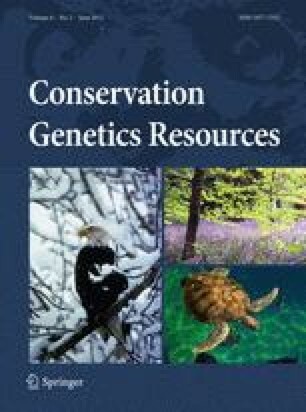 A total of 84 fish from two populations (including one rescued into captivity) were successfully genotyped at all markers using a multiplex approach. As expected for threatened species, we observed relatively low genetic variation across most loci (average allelic diversity = 5.4; average heterozygosity = 0.380). No evidence for linkage disequilibrium was detected and all loci were in Hardy–Weinberg equilibrium. This new set of microsatellite markers will benefit substantially the ongoing conservation program of a critically endangered population of M. adspersa that involves captive breeding, relatedness and paternity analyses, reintroduction, and landscape genetics. Funding for this study was provided by the Australian Research Council (LP100200409 to Beheregaray, Harris & Adams). Additional support was received by DENR, SA Museum, SA Murray Darling NRMB, PIRSA Fisheries and Native Fish Australia (SA). We thank Mark Adams for providing tissue samples and Mike Gardner for assistance with data analysis. DC is grateful to CAPES/REUNI (Brazilian Ministry of Education) for his postdoctoral fellowship.